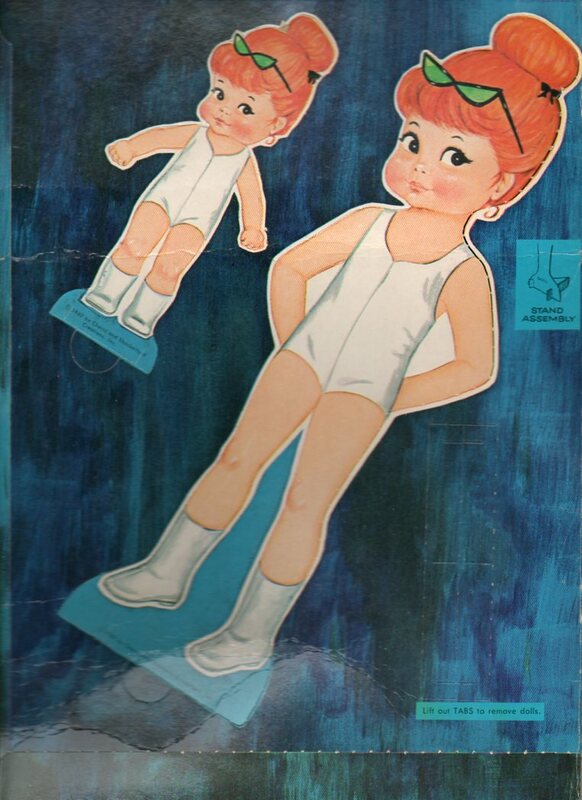 This is a vintage paper doll that I picked up a little while ago. 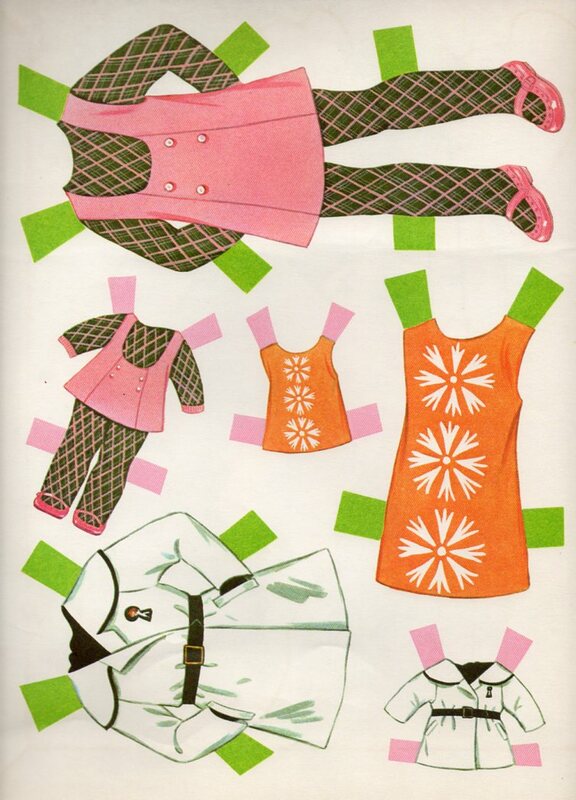 She’s also adorable and this is one of those mid-60s sets which had two dolls (a big and a little) with matching outfits. 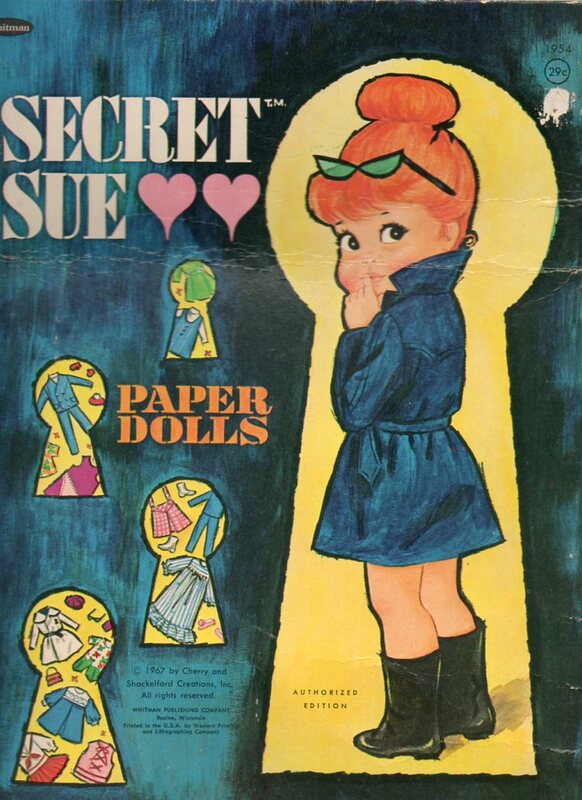 I especially love the white trench coat outfit — it reminds me of Agent 99 from the Get Smart show. 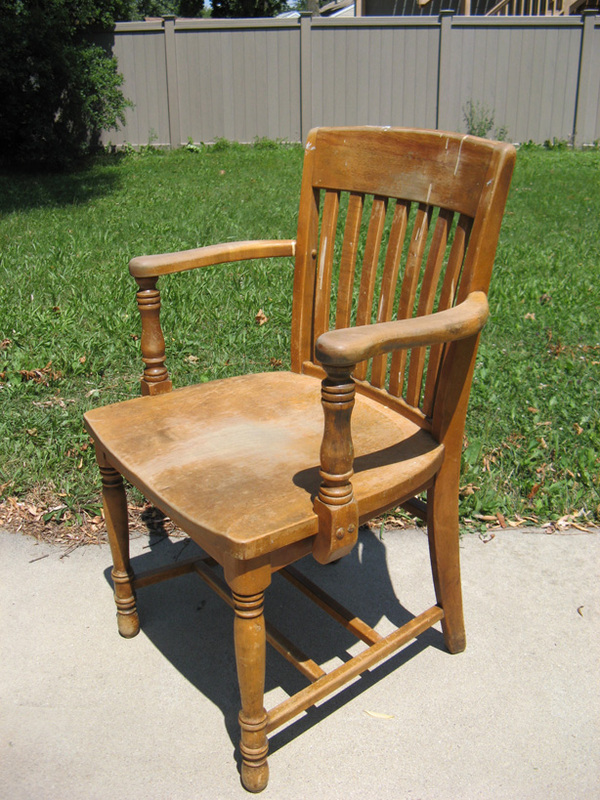 It’s an older wooden chair that came out of one of the city offices (there’s a little metal plaque on the underside of the seat). 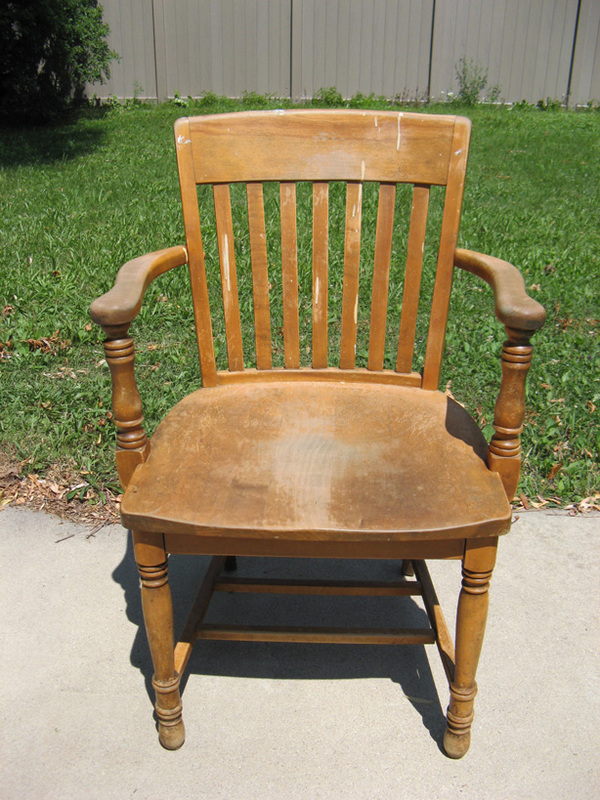 What drew me to it was the incongruity of the straight forward no-nonsense slatted back and dished seat combined with those rather odd curved arms and turned arm supports and front legs. 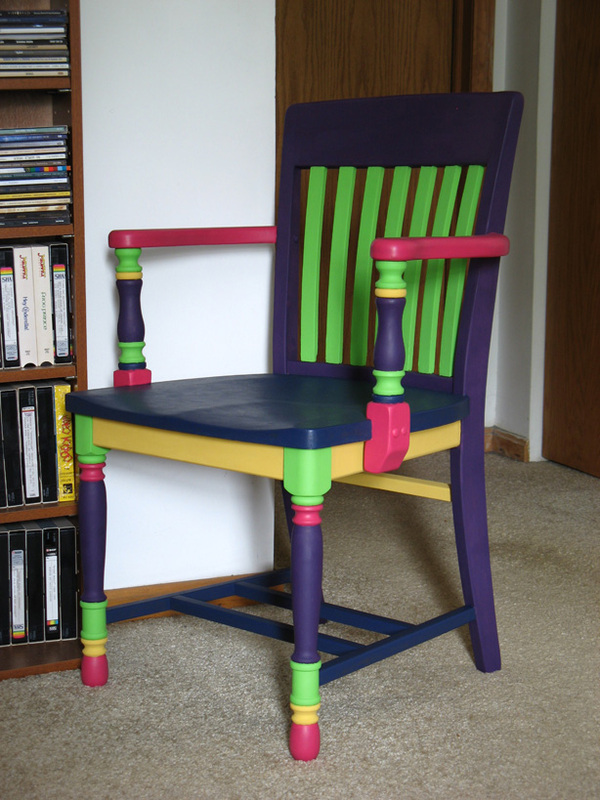 This was a chair that screamed out “I want to be Silly!”. I’m calling it Motley. What with the Jester colors I chose to paint it, I couldn’t very well call it much of anything else. The dominant color is the dark purple of the back, back legs and larger portions of the turned areas. The green is so very nearly neon that I’m glad I chose a darker rose and an almost school bus yellow as the other bright colors. The seat and stretcher bars I painted a dark blue to add balance and a bit of (strictly tongue in cheek) gravitas. A side note on the names paint manufacturers give to colors. 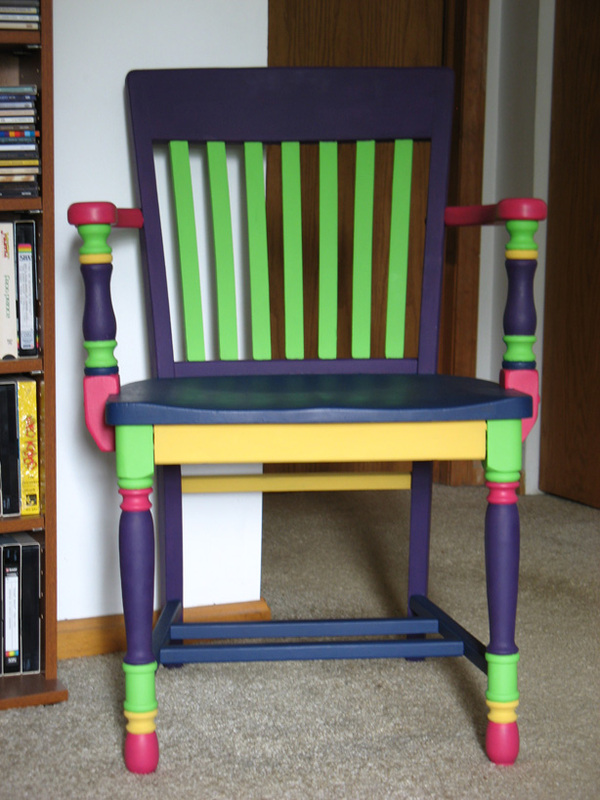 I used a national brand of acrylic craft paint on this project and if you can believe it they called this particular green: Apple Orchard. Apple Orchard, mind you, Apple Orchard; where is the hypothetical orchard this color came from? The Altered States of Drugachusetts*?? *Yes, I’ll admit it. I’m a huge Mr. Show fan and will watch very nearly anything (even if it’s otherwise rather sucky) if David Cross is in it. 13-1/2″ tall (with staff 16-1/2″). 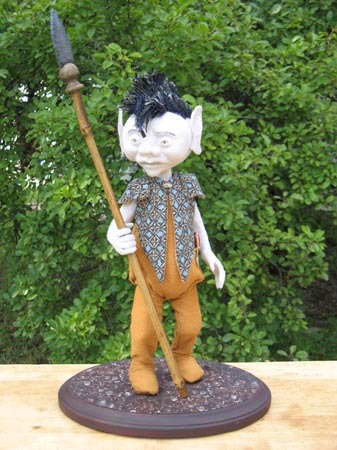 Natural bamboo staff with an arrowhead made from polymer clay. And yes, that’s a mohawk cut made of my signature shredded fabric. Sorry for the abbreviated post, I’m having internet difficulties today. Perhaps because the rain has driven all the children indoors and those who aren’t umbilically connected to their gaming system are most likely glued to their computers on the net. 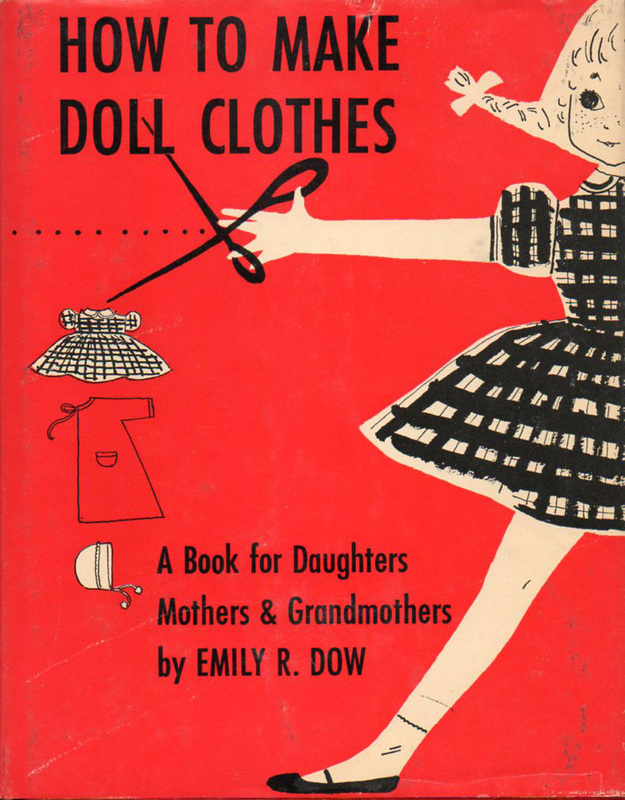 Here is a lovely little vintage book about making clothes for your dolls. The copyright is 1953 so the language is a bit quaint but the information is surprisingly comprehensive. The book is out of print so I got my copy on ebay where it does pop up every now and again. I was lucky and got a copy with the adorable dustjacket. 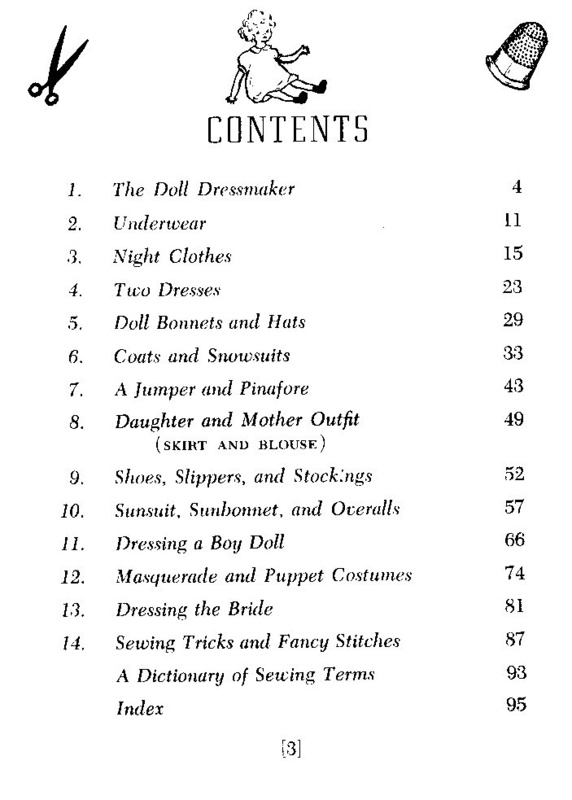 As you can see from the contents page this book is designed to give you the ability to make an entire wardrobe. 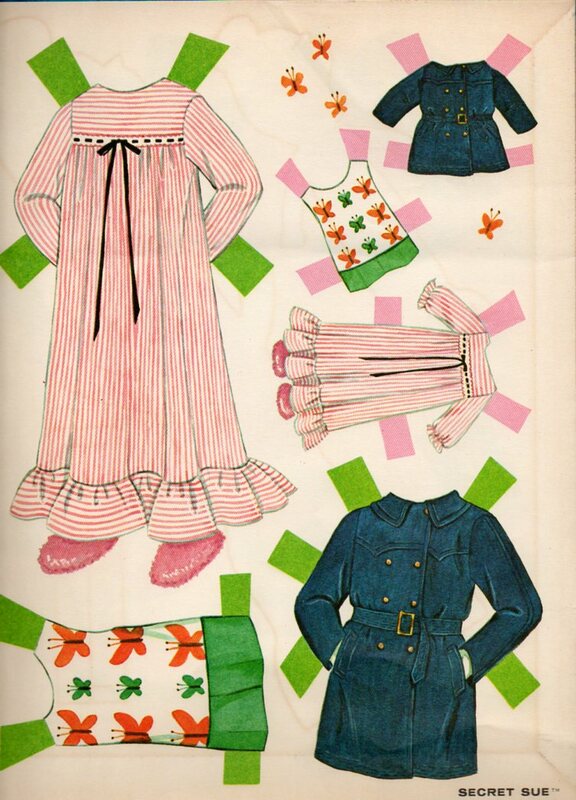 No namby-pamby dancing around the need for dolly to have clothes for every occasion. The style of the clothes are fairly simple so that they’ll be quick to make up while still having enough detail to satisfy the eye. Notice the darling slash and gather dart detail at the waist of the slip. 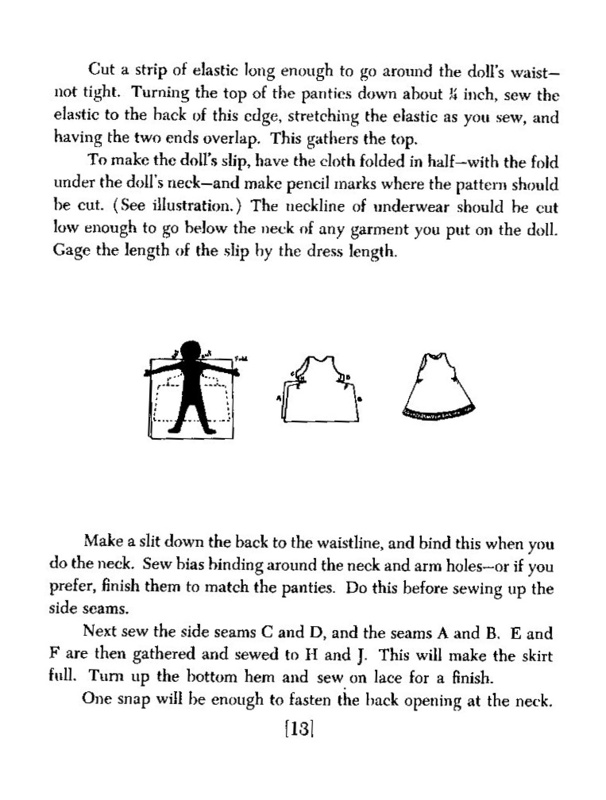 There aren’t any ready-made patterns in the book; the idea is for you to learn to draft patterns to fit the specific doll being clothed. 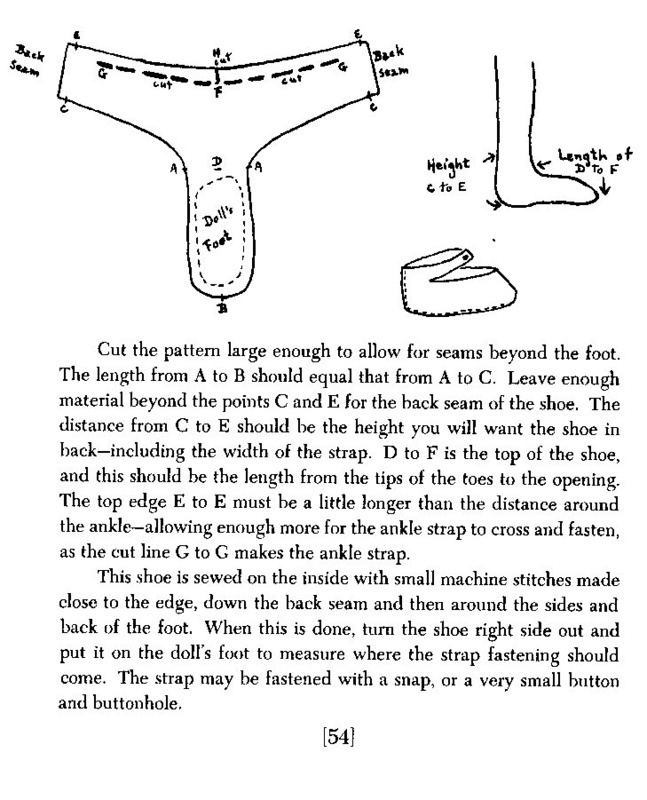 The directions start out with simple pattern draping and branch out to a bit of pattern drafting for some of the patterns later in the book. 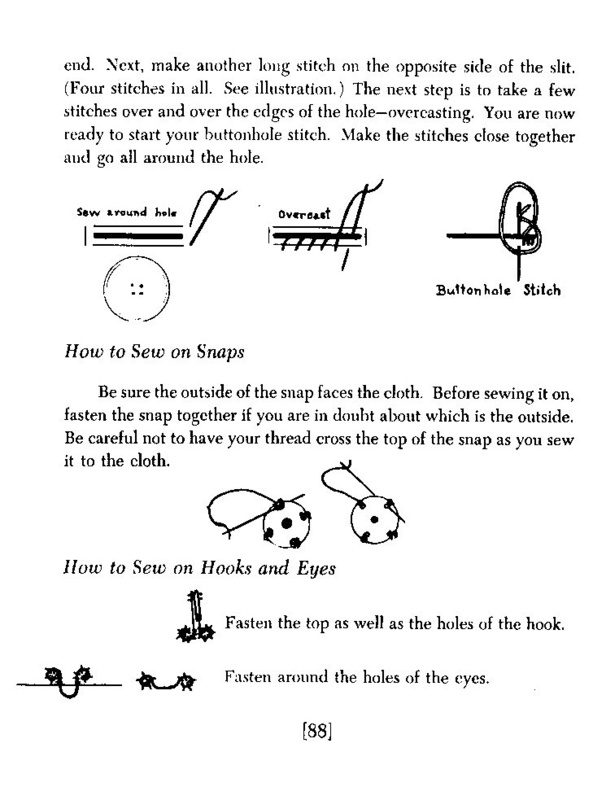 The how-to-sew information in this book is refreshingly complete. Unlike many books published today it doesn’t “dumb-down” by over-simplification. The writer assumes that the person using the book wants to make a quality product that is going to hold up to little girl usage and the little bit of extra time and effort spent doing so are well worth it. 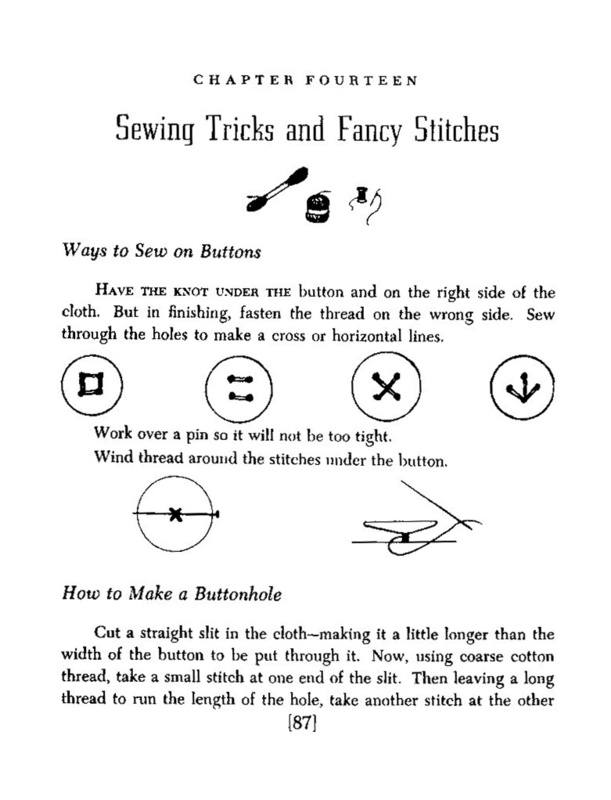 For instance this is the best explanation of how to do a proper buttonhole that I’ve ever seen in a basic-level sewing book. The only complaint I can make is that the instructions call for the inclusion of one of my pet bugaboos: acute angle inside corners. As a child I found them a complete and total pain in the backside and to this day prefer to avoid them. 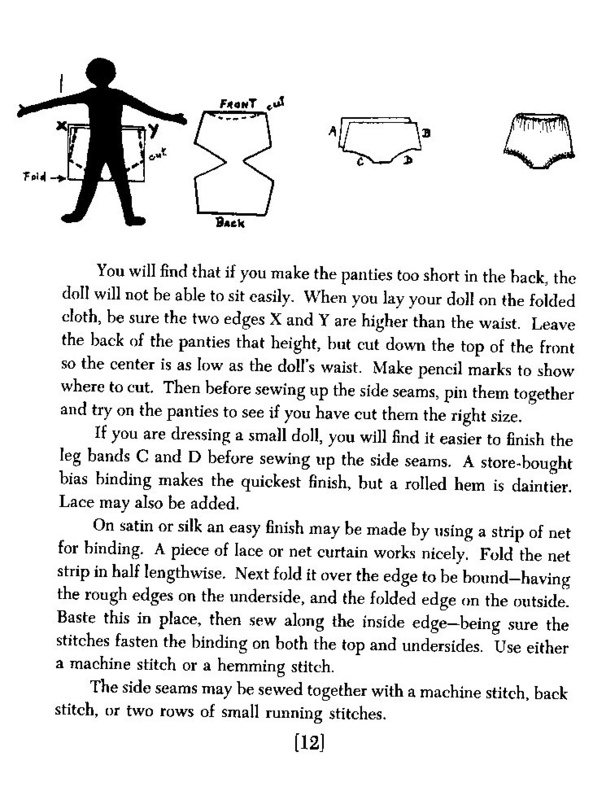 I learned early to eliminate an acute angle beneath the arm or between the legs by breaking up the pattern into more pieces to obtain that vital fray-and-bunching preventing seam allowance. On the up-side it does teach how to do linings and how to bind an edge. Both of which eliminate any need for dealing with my other pet bugaboo: narrow hems on curved edges. Too fiddley by far for a child and again I’ll go a long way out of my path to avoid them now. So if you enjoyed this post, get yourself access to a copy of this book — you may just end up wanting one for your very own (try ebay or amazon marketplace). FYI, Michigan residents: the Michigan library system has copies of this available, your local librarian can get one through the inter-library loan system. Or for those of you in the know; request your own loan via melcat (www.mel.org). Ooooh Yes! I do so love the library.